Returning to school to get a graduate degree isn’t for everyone and there are several things to consider including cost, time commitments, working while getting a degree, and other life events. 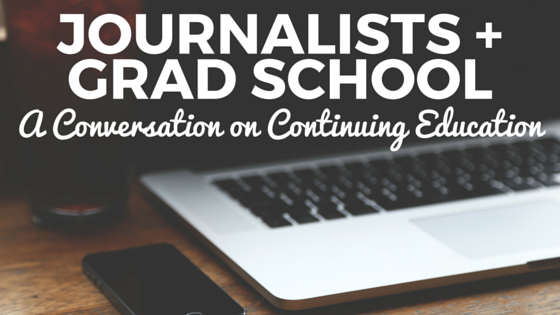 Recently, ProfNet hosted a webinar called “Should Journalists Consider Grad School? A Conversation on Continuing Education” that may guide you and point you in the right direction if you are considering whether graduate school for journalism is the right move for you. Our guest was Kevin M. Lerner, who serves as an assistant professor of communication/journalism at Marist College in Poughkeepsie, New York. He teaches American press history, media law, narrative journalism, news editing, and reporting and writing integrating contemporary technology and social media tools. Lerner discussed the questions to ask yourself when considering a graduate program, what to expect when you step foot in the classroom after several years away, how to make use of your degree, and much more. What follows is a recap of the webinar, with a link here to the full presentation. What’s the first question you should ask yourself if you’re thinking of attending grad school? Why are you doing it? Have a clear idea why you’re going for any reason. Don’t do it if you have no other idea what to do. You need to be clear with regards to the goals you want to accomplish. Spend some time planning and researching programs before applying. In the eyes of the hiring manager, does it make a difference whether you get your graduate degree immediately after finishing undergraduate studies versus years after receiving a bachelor’s degree? Or is it better to work a few years and then return to school? There’s not one answer to that since the students and hiring managers come from so many backgrounds. However, it may be better for most to have a few years of experience so you understand what the world of professional journalism is like before considering a professional degree. Learn a technical skill – Audio, video, digital, etc. Learn a specialized content area. Become a specialist in the area you cover. Study with a particular person or group of people. Know the program to which you’re applying and do it because it has the people, tools or program in which you’re interested. Learn from experienced editors without daily deadline pressure. Does a higher paycheck await with a journalism graduate degree? There is no guarantee. You’re not going to know that having this degree will get you more money. It’s not like a degree in engineering or law where it’s a requirement for these jobs. Some of the highest paid journalists never went to graduate school. There’s no requirement. Anyone can do journalism whether or not you’ve gone to journalism school. A degree can attract more prestigious publications and outlets if you have knowledge-based education where you can come in and demonstrate a skill you couldn’t before. Medical and business reporters, for example, can do very well. Be an expert at something. Cost. It can be very expensive and you can have debt for a long time. Know going in you’ll have to pay as there are few scholarships for professional programs. To secure an entry-level job. If you haven’t been working as a journalist, have no experience and want to put it on a resume, then it may be a reason but not the main one. Because you don’t know what else to do. Go with a purpose. Some say experience is more important than a graduate degree. Do you think this is true in some cases? Once you get to a certain level of experience, a master’s program in journalism isn’t what you’re looking for. If you’ve been around for 15 years and you’re stuck, you’re better off using your resume. It’s not for everyone. The programs purely in journalism are very new, few and may be the future but a lot of the benefit is the face to face interaction you have with editors and professors. Since online programs are new, we don’t know the effects of them on career. What should you expect once you step foot in the classroom for the first time after a long absence from an academic setting? It may depend on the length of absence. If away for a while you may be surprised how technological classrooms have become. Classes are based in computer labs and pace is more similar to a professional pace than an undergraduate pace. Deadlines move at difference pace. You’re working on a three-month basis for a course instead of a daily or weekly deadline. How does a graduate degree help? The value lies in the education, not the training. It’s a matter of taking time out from daily career pressures and thinking of what you do as a journalist. You can get a self-awareness you may not get if you’re trying to just please your editor or producer. It’s about trying to make the best quality journalism you can and understand how what you do fits in the world of journalism.